Classic light dub elements prevail as undercurrent to the opening gambit, ‘Fog’. Psychedelic swirling synths accompany the beats and hypnotic bass line and intermittent sampling; whilst being fairly effective and inoffensive, it’s nothing to write home about. The flimsy half-track of ‘Defections’ leads to the spacey, late 60’s feel of ‘Thang’. Emphasis is laid upon the sounds coming across like the audio equivalent of a mushroom party with some mad crazed carnival hypnotist sat on the decks. 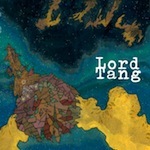 I see what Lord Tang is trying to accomplish, indeed there are going to be many folks out there that will applaud this album from start to finish. Whilst being composed with some degree of professionalism, there isn’t much on this releases track by track that’s stands out in its own right, bordering too much on the hippy contingent for me to stomach without wanting to fly off the handle and tear it to bits; which would I guess be marginally unfair. This entry was posted in Alarm, Dense Promotion. Bookmark the permalink.